Last week we asked. 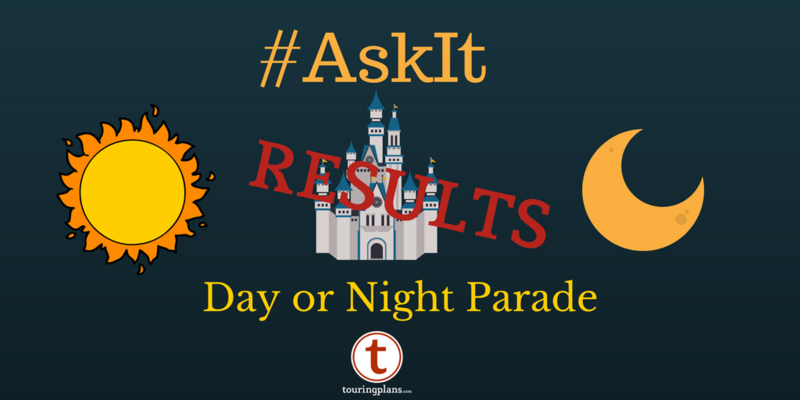 “if you could only have a day parade or a night parade at Walt Disney World, which would you prefer?.” And you answered here on the blog and on Twitter. And the clear winner was the Nighttime parade. Whether it’s SpectroMagic or the Main Street Electrical Parade, there’s just something iconic about a parade at night. Some of you had commitment problems and said a “day parade during the cooler months and a night parade during summer.” Others made the very valid point that day parades cut into your napping and pool time. It’s strange to realize that there is currently no nighttime parade at Walt Disney World. And no parades at all outside of Magic Kingdom. If Festival of Fantasy doesn’t do it for you, Paint the Night returns to Disney California Adventure April 13! Or hop across the ocean to see Tokyo Disneyland Electrical Parade Dreamlights at Tokyo Disneyland park. 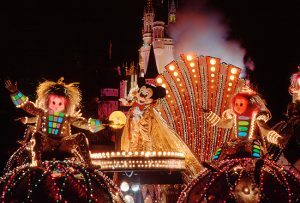 And don’t forget the parade on the Seven Seas Lagoon – the Electrical Water Pageant. There aren’t many things at Walt Disney World that are still running since 1971, but this is one. Sure there have been a few changes. And maybe Was (Not Was) wasn’t a cultural touchstone when “Walk The Dinosaur” was added to the soundtrack seven years after it was barely a hit. It’s still a delight.